Is it contrary to Canon Law to insist that funerals of priests accused of abuse must take place in private chapels? 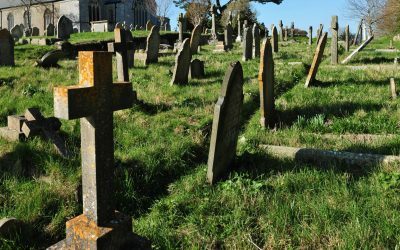 Several diocese and religious orders have policies that allow church funerals to be denied to clergy that have been accused of sexual abuse, says the Association of Catholic Priests (ACP). Instead, requiem Masses for these priests are being held in private chapels, with no death notices published in national or local media. The National Board for Safeguarding Children in the Catholic Church in Ireland (NBSCCCI) has had a “Guidance on the Funerals of Clerics or Religious against whom there is a Case to Answer” available for several years now. It includes considerations as to whether those who made complaints against a priest should be informed of his death; what role other priests of a diocese or a religious community should play in a funeral Mass; how the location and the timing of the requiem Mass might have a negative impact on complainants; what burial sites are appropriate; and what inscription should be put on headstones. The guidance document is not an exhaustive list, the NBSCCCI admits. It appears that several diocese and religious orders have put additional measures of their own in place. “A number of priests have contacted us to say that as a group they are being singled out and treated differently to everybody else,” Fr Tim Hazlewood, a member of the ACP’s admin team, told CatholicIreland.net. Fr Hazelwood says the ACP has in its possession two policy documents – one belonging to a diocese and one belonging to a religious order – where restrictions go beyond what is proposed by the NBSCCCI. The diocesan guideline suggests “consideration be given to have the funeral liturgies in a private chapel and/or a time other than the usual times”. When the notorious child abuser Fr Brendan Smyth was buried by the Norbertine Order, his funeral took place before dawn and the grave was covered in concrete to stop it being vandalised. But the ACP say there are priests who are being denied normal funerals even though the accusations against them have never been proven and are unlikely to ever be substantiated. Holding funerals in private chapels appears to be contrary to normal Catholic practice. In an online guide to Catholic funerals, prepared by St Mary’s University in London, it says “a funeral is a public event so anyone can attend”. False allegations of abuse have been made against priests in the past, as Fr Hazelwood knows to his cost. Two years he had to take a civil case to the High Court before a person making false accusations against him admitted he had been lying. He said that Church policy in this area is not priest-friendly and that there is a presumption of guilt. The Cloyne diocesan parish priest points to the fact that the NSBCCCI operates to seven different standards: creating and maintaining safe environments, procedures for responding to child protection concerns and allegations, care and support for the complainant, care and management of the respondent, training and support for keeping children safe and quality assuring compliance with the standards. “All of these standards are audited, except for the one to do with the care and management of the respondent,” said Fr Hazelwood. “So if it’s not audited, it’s not worth the paper it is written on and priests are left in a very vulnerable position. Why does the Church treat us differently? Why do these special funeral arrangements only apply to priests and to no one else? It is not fair to priests, some of whom might be suspended from ministry for decades on the basis of unsubstantiated allegations. Then when they die and they don’t get a proper funeral, their families have to live on with hurt and shame.